It could be said our readings this Sunday are about fresh starts, after a long absence. In our first reading, the Israelites recommit themselves to God's word as they seek to rebuild Jerusalem after their return from exile. In our Gospel reading, Jesus proclaims himself the long awaited fulfillment of Isaiah's prophesy of the Messiah, caring for the weak and sick and proclaiming a year of favor of the Lord (a jubilee year of forgiveness and reinstatement). In our first reading (Nehemiah 8:2-4, 5-6, 8-10), the priest Ezra read and interpreted to the people the Law of God (the Torah that most had forgotten while in exile). Ezra and Nehemiah, the governor of Judea, proclaimed, "Today is holy to the Lord your God. . . Go, eat rich foods and drink sweet drinks." Ezra the priest brought the law before the assembly, which consisted of men, women, and those children old enough to understand. Standing at one end of the open place that was before the Water Gate, he read out of the book from daybreak till midday, in the presence of the men, the women, and those children old enough to understand; and all the people listened attentively to the book of the law. Ezra the scribe stood on a wooden platform that had been made for the occasion. He opened the scroll so that all the people might see it - for he was standing higher up than any of the people -; and, as he opened it, all the people rose. Ezra blessed the LORD, the great God, and all the people, their hands raised high, answered, "Amen, amen!" Then they bowed down and prostrated themselves before the LORD, their faces to the ground. Ezra read plainly from the book of the law of God, interpreting it so that all could understand what was read. Then Nehemiah, that is, His Excellency, and Ezra the priest-scribe and the Levites who were instructing the people said to all the people: "Today is holy to the LORD your God. Do not be sad, and do not weep"- for all the people were weeping as they heard the words of the law. He said further: "Go, eat rich foods and drink sweet drinks, and allot portions to those who had nothing prepared; for today is holy to our LORD. Do not be saddened this day, for rejoicing in the LORD must be your strength!" In our Gospel reading (Luke 1:1-4, 4:14-21), we hear first, the opening of Luke's Gospel and then transition to chapter 4. 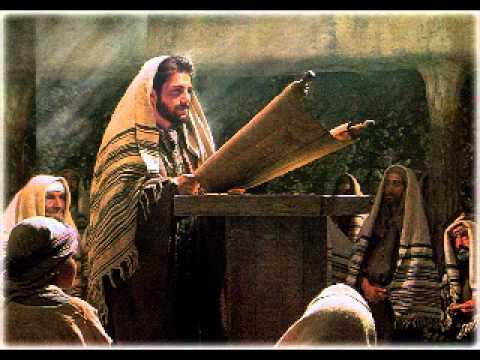 Jesus went to the synagogue in his home town and read from the scroll of Isaiah. The passage was seen as a prophesy of the Messiah. Jesus manifests himself as the fulfillment of that passage; He is the Messiah. Since many have undertaken to compile a narrative of the events that have been fulfilled among us, just as those who were eyewitnesses from the beginning and ministers of the word have handed them down to us, I too have decided, after investigating everything accurately anew, to write it down in an orderly sequence for you, most excellent Theophilus, so that you may realize the certainty of the teachings you have received. Jesus returned to Galilee in the power of the Spirit, and news of him spread throughout the whole region. He taught in their synagogues and was praised by all. He came to Nazareth, where he had grown up, and went according to his custom into the synagogue on the sabbath day. He stood up to read and was handed a scroll of the prophet Isaiah. He unrolled the scroll and found the passage where it was written: The Spirit of the Lord is upon me, because he has anointed me to bring glad tidings to the poor. He has sent me to proclaim liberty to captives and recovery of sight to the blind, to let the oppressed go free, and to proclaim a year acceptable to the Lord. Rolling up the scroll, he handed it back to the attendant and sat down, and the eyes of all in the synagogue looked intently at him. He said to them, "Today this Scripture passage is fulfilled in your hearing." In our Epistle reading (1 Corinthians 12:12-30), we hear a continuation of last Sunday's Epistle (many gifts but one spirit). In this passage, the theme continues - we are all one body though we are many parts. It speaks to the wide diversity of callings from our God, each to serve a different aspect of the Church. Brothers and sisters: As a body is one though it has many parts, and all the parts of the body, though many, are one body, so also Christ. For in one Spirit we were all baptized into one body, whether Jews or Greeks, slaves or free persons, and we were all given to drink of one Spirit. Now the body is not a single part, but many. If a foot should say, "Because I am not a hand I do not belong to the body, " it does not for this reason belong any less to the body. Or if an ear should say, "Because I am not an eye I do not belong to the body, " it does not for this reason belong any less to the body. If the whole body were an eye, where would the hearing be? If the whole body were hearing, where would the sense of smell be? But as it is, God placed the parts, each one of them, in the body as he intended. If they were all one part, where would the body be? But as it is, there are many parts, yet one body. The eye cannot say to the hand, "I do not need you, " nor again the head to the feet, "I do not need you." Indeed, the parts of the body that seem to be weaker are all the more necessary, and those parts of the body that we consider less honorable we surround with greater honor, and our less presentable parts are treated with greater propriety, whereas our more presentable parts do not need this. But God has so constructed the body as to give greater honor to a part that is without it, so that there may be no division in the body, but that the parts may have the same concern for one another. If one part suffers, all the parts suffer with it; if one part is honored, all the parts share its joy. Now you are Christ's body, and individually parts of it. Some people God has designated in the church to be, first, apostles; second, prophets; third, teachers; then, mighty deeds; then gifts of healing, assistance, administration, and varieties of tongues. Are all apostles? Are all prophets? Are all teachers? Do all work mighty deeds? Do all have gifts of healing? Do all speak in tongues? Do all interpret? There are a number of themes in today's readings but the foremost is Jesus' proclamation that he is indeed the Messiah, the Anointed One. The Gospel reading next Sunday continues this story as Jesus is rejected by the people of his own town and driven out of the temple. In many ways, our society still rejects Jesus and seeks to drive him out of our temples, our institutions and our hearts. May our heartfelt and passionate response to the word of God, like those who heard Ezra proclaiming the Law, seek to reestablish Jesus as the central focus of our lives and our world.